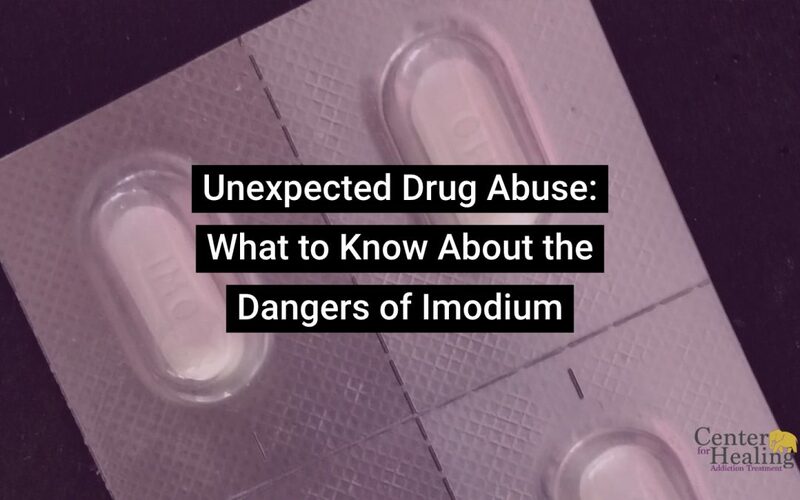 Even though Imodium is a common over-the-counter medicine, it’s increasingly used for drug abuse. With the current opioid epidemic, users are taking this everyday medication to get high when opioid drugs aren’t available. Loperamide hydrochloride, sold as Imodium, treats diarrhea as an opioid agonist. Unlike other opioids, this medication doesn’t pass the blood-brain barrier to affect opioid receptors. Instead, Imodium stays in the digestion tract and slows contractions while easing diarrhea. At very high doses, Imodium binds to opioid receptors in the brain. It works the same way as heroin, oxycodone, and other opioids, leading to an “Imodium High.” This high can allure those with addiction or those suffering from withdrawal. High amounts of Imodium cause the heart, kidneys, and liver to slow down. It also stresses the lungs, making it difficult to breathe. If someone overdoses, individuals can experience depressed breathing, paralyzed intestines, cardiac problems, dehydration, and urine retention. Most users aren’t aware that abusing Imodium can be fatal. In fact, the National Poison Center reports a 71% increase in calls related to loperamide overdosing in 2011 to 2014. Called the “poor man’s methadone,” loperamide is inexpensive and simple to find. The large doses needed to get high can range from 50 to 300 pills a day, around $10 a bottle. People with opioid addiction can abuse loperamide without draining their bank accounts. Unfortunately, just because it’s legal, doesn’t mean it’s safe. Those addicted to opiates can take loperamide in high doses to lessen the effects of withdrawal. To prevent withdrawal and to mimic the effects of opioids, high doses are still needed. This can increase the chance of Imodium abuse causing side effects and death. Imodium abuse to get high or to minimize opioid withdrawal symptoms puts individuals in danger. Though pharmacies everywhere carry loperamide, using it for anything other than anti-diarrheal isn’t safe. Someone going through opioid withdrawal should contact a medical professional or drug-abuse counselor to help reduce symptoms in a safe environment. If you or someone you love needs help overcoming drug abuse, contact us today or give us a call at 888-500-9279.